Some secrets chill to the bone….a thief is targeting the seniors of a small Northwoods town so new sheriff Rodd Durand and Wendy Carey, home health nurse, will do anything to stop him while trying not to do something even more dangerous — fall in love. Will Rodd and Wendy be able to stop the thief before any more people from this small Northwoods town are targeted before they call in love? To see if Rodd and Wendy will be successful, I’ve been joined by Lyn Cote for a super speedy insight into what awaits in the reader in the first novel in the Northern Intrigue series, ‘Winter’s Secret’. Lyn, I’m intrigued to find out what initially sparked your imagination for the mystery and romance in this book. I love the setting of the Northwoods. Have you spent much time in the Northwoods yourself? Yes, I live in the Northwoods and love them. How did your characters come to life in this setting? I always have to find the right name and then they come. And once you have the setting, the names and your characters all good to go, what did you want them to say to the readers in ‘Winter’s Secret’? I write about the abundant life-what God wants for all of us. I force my characters to face this and conquer whatever keeps them from living abundantly. Living abundantly is a great target, but sometimes I imagine there’s some challenges or things you need to resolve so that the lives of your characters ring true. What did you learn to meet the challenge of writing abundant lives for your characters in this novel? I had to learn a lot about law enforcement. Fortunately, a local sheriff helped me out. Law enforcement sounds like a great knowledge base to have, I’m sure you’ll dig into that world again! Speaking of digging into new writing projects, what are you currently working on? A frontier historical about a man born half Osage and half white and the Eastern lady he falls in love with. That sounds like the start of another great series. When you think of writing a new series or just writing, in general, do you find that writing energizes or exhausts you? Well, it looks like you’ve managed to work through the exhaustion to bring a wonderful story to life. When you look over all of your stories to the central brand that you are creating, what do you describe your brand as? My brand is Strong Women, Brave Stories. And I hope this love keeps you writing well into the future. Lyn, thanks for chatting with me today and I wish you the best of luck with ‘Winter’s Secret’. Excited to read the book we discussed today? Find it here on Amazon: ‘Winter’s Secret ( ASIN: B006R7FXFW )‘. 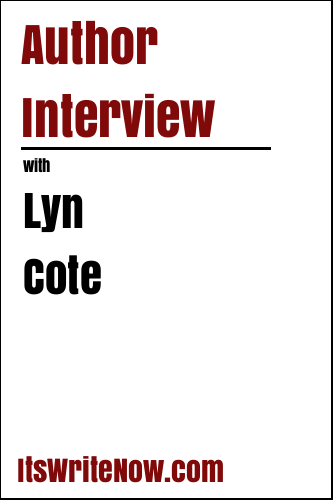 Want to find out more about Lyn Cote? Connect here!